Waiting in line to catch a theatre show a man falls to the floor dead, a knife in his back. Those around him claim to have little recollection of the man or if anyone approached him. Inspector Alan Grant is assigned the case, which quickly proves difficult to solve. Even identifying the man is not straightforward. Slowly, however, Grant makes progress, but it’s not at all clear he’s on the right trail. 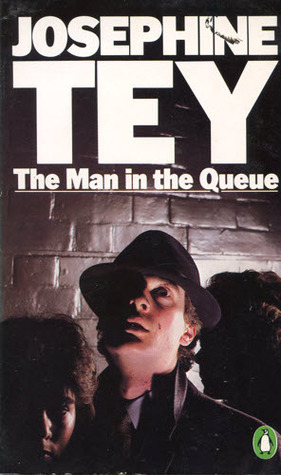 The Man in the Queue was published in 1929 with Josephine Tey using the pseudonym of Gordon Daviot. It was her first published crime novel. It’s a somewhat curious book being highly uneven in its telling (with some overlong descriptive pieces that little move the story on, as well as quite astute observation), utilising some fairly clumsy plot devices (e.g., no labels on or identifying material in his clothes), and some parts making little sense (e.g., not re-interviewing an actress, using description of victim rather than circulating a photo or sketch of his face, not arresting the prime suspect at first opportunity when cornered). Moreover, the book has some fairly racist undertones (e.g., Grant knew … the Dago’s rat-like preference for the sewers rather than the open’; as well other assignments of characteristics on the basis of appearance). The ending, in particular, is very weak with a hurried denouement which feels contrived and awkwardly staged. All of this was somewhat of a surprise given the high regard in which Tey is held by crime fiction aficionados (in 1990 the CWA selected The Daughters of Time as the greatest crime novel of all time and The Franchise Affair came in eleventh). However, reading other reviews the consensus seems to be that The Man in the Queue is her weakest outing and is definitely not the one a new to Tey reader should try first. I tried to read this recently for first books on FFB and found it unreadable. FRANCHISE AFFAIR is my favorite. Thanks for your honest and most helpful review. I will skip this one and be satisfied with having read _Daughter of Time_ and _Franchise Affair_. All the best from the U.S. Gulf coast and Past Perfect Murders. It's the clunkiness and contrived nature of the plot that really grated for me, which was a shame as there was some nicely observed and written passages at times. Heard so many good things about Daughter of Time. Everyone tells me that i must read it. . I decided that prior to reading D of T, i should begin with the 1st book in the series. Well after 20 pages i could tell that this book is not for me. The writing is surprisingly poor & the characters seemed like cardboard cutouts. So disappointing. Not going to waste any more time with this, luckily it is a library copy. 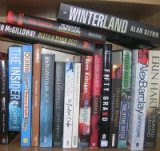 Not sure if i will attempt any others in the series - so many excellent books out there. I was thrilled to see that you had just reviewed this, love your closing piece of advise. Thanks for a good review of a mediocre book!